OK. I'm back. 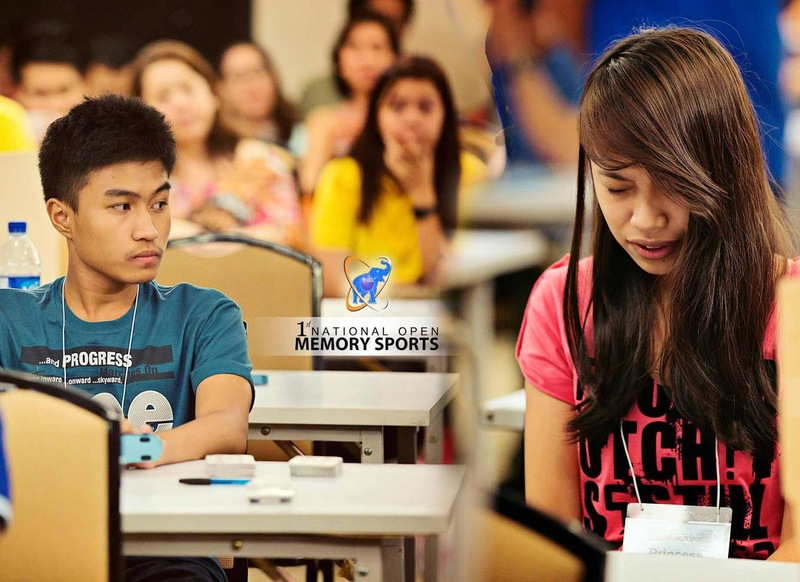 And if you are wondering why we're here, well, this is the second part of the review that I'm doing of last month's 1st National Memory Sports Open or the Philippine Friendly Memory Championships 2013. At this point of the competition, Erwin Balines, the Philippine's second ever Grand Master of Memory was leading the pack with 2,509 championship points. He was followed by Mark with 2,293 championship points and trailing at third is myself with 2140 championship points. There was not much changing of hands in the leader board except when Mark took the lead after the third event where he was ahead of Erwin by around 100 championship points and on the following event, the 10 minute cards, where I briefly took the second spot ahead of Mark. I think Mark made some awful recall errors where he was only credited with just 15 cards. I, on the other hand, just managed to get one and a half deck right out the five that I tried to memorize. This is one of those events where, due to lack of restraint, overzealousness, or hubris, I overextended myself and was left grasping at a number of hazy images that I thought was manageable. Unlike Erwin, who coolly settled for four out of four decks and went on to win this round handily. video cams as it didn't turn out well for him. One thing I realized during the awarding for this event, was that there was such a thing as tie-breaker to determine the proper athlete's proper placing in the standings. That even if I were able to get a tie with Erwin with four decks, he would still be getting the Gold, since I declared more decks than him. So, here's a tip that I think is very much valuable, especially in marathon card events, go for a number of decks that you know you will get perfectly or that is very much manageable. By the way, Axel Tabernilla came away with the silver medal here with three decks and I got the bronze for the adults but overall, Jamyla Lambunao and a host of other youngins had way more cards memorized than me. Next up would be the five minute numbers. I think we only had one trial for this one because of time constraints. And that made a significant difference in the way a memory athlete would approach things. Normally, we have two trials for this event and most would either get a safe attempt at first trial and if they get perfectly, they'll go for broke and memorize as many as they can on the second trial. Buuut only a bunch of us minded the situation since most of them are just raring to go and enjoying the events of the day. 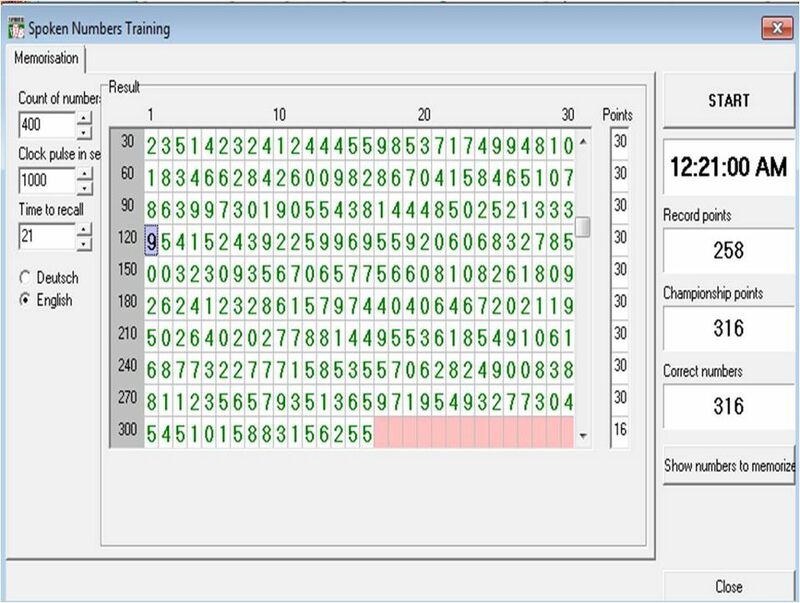 With the event contracted, Mark would need to make up for his 41 point blunder in the previous event but he settled for a dominant 220 digits, which were followed by our safe 178 and 162 attempts, me and Erwin respectively. The next event would be five minute random words where we saw Erwin Balines smashed the Philippine record with 60 words and Ms. AB Bonita tied it with her 50 words. Rounding up the third is Jamyla with just two short of tying it with 48. I'd rather forget how I did with this one, I landed smack dab in the middle (14th) with 16 words. I think I made a bunch of silly mistakes here, like remembering the image but not the proper word that it represented. I didn't know if it was supposed to be a missile, a cannon, or a rocket. Or if those were even the words. I just knew some projectile was shot... or was the word projectile? Hmm..
Anyways, heading into into the spoken numbers event, Erwin had a comfortable 782 point lead over Mark, which he would cut down to 577 with his 100 digit spoken number performance. 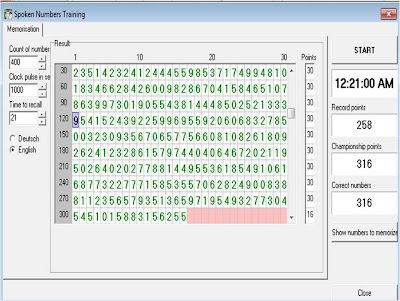 He would have needed to replicate his personal best of 316 digits (2 points shy of the current world record) in this event to get an even chance going into the final event, the speed cards. Going into the last event of the day, it was already a foregone conclusion that Erwin will be the inaugural champion of the first ever National Open on Memory Sports, at least if any of the results from the previous events were announced or posted. 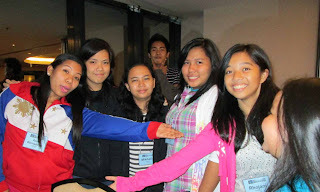 But we had to wait for the awarding ceremonies to get an idea of our performances for the day. Intense focus at the final event, speed cards. It was already around 8 pm when we started with the speed cards. And it was about to be done like the speed numbers that was limited to a single trial. We were seeking clarification from different arbiters if it was really be just a single attempt but the answers we get were varied as well. So we went on with the first attempt without knowing if we'll get a second one, which made me decide to go for a safe one minute and forty plus seconds. Buuut since I usually start my memorization after two minutes the chief arbiter says go, my arbiter insisted that I'd only be credited with the full five minutes. An unnecessary distraction that I had to iron out before the start of the recall phase. They eventually agreed to credit my original attempt just in time for the recall but all that trouble was for naught when I failed to get all the cards in proper order. I was about to accept that my day would end with a sour note until the chief arbiter Rafi Delica, seemingly awed from witnessing kids memorizing decks of cards, suddenly announced that a second attempt will be squeezed into an already overdue event. Huge props to the wonderful venue at Alphaland that they allowed the event to push through way into the night. This second chance gave me an opportunity to redeem myself. I made sure this time that I had it all perfectly in my head that I ran through it for several times before I stopped the clock at exactly one minute and 15/100 of a second. It was just enough to get another silver at this event as Mark did his cards a little over seven seconds faster than mine. And if I'm not mistaken, Erwin was not able to improve his time in his second attempt and settled for third. While we were about to start the recall, I noticed that the arbiter misread my time as 1 min. and 15 seconds, which prompted me to correct him swiftly. But as he left after correcting the error, I did a double take at it because he corrected my attempt by removing a whole minute and credited me with just 15 seconds! If had I not notice it, I would have been just 54 points short of winning the championship and end up being a runner up. I wouldn't have known if I'd be happy for landing second or be very regretful for being just a few points shy of being the champion. Good thing that it ended the way it did though, it just showed me how much I needed to improve. It is in this event, aside from the overall results not being included in the official world ranking, that an official arbiter would have been handy as there were two other people that managed to get under two minutes. Axel's one minute and forty seconds and Jamyla's quick one minute and seventeen seconds would have qualified them for a Grand Master Norm. Much of what I have written were about the adult's division since I am in that category. The younger categories in the tournament ended with not much of a surprise either. The Kid's division was largely owned by the 11 year old Jamyla Lambunao of St. Scholastica, where she won gold in every event except in speed numbers, she was just five digits short of winning that event. It was a very dominant performance by Jamyla that she almost doubled the score of her nearest competitor. Her scores were good enough to beat the older mnemonists at the tournament. But it was all to be expected from her. She was three years ahead of her division peers in training in memory sports and is a veteran of several international events including the World Memory Championships. However, the performance from her competitors are nothing to sneeze at either. They were impressive for someone who had just a summer's worth of training. Much props must be given to their coach, Ms. AB Bonita, as well. She did a wonderful job at getting her students into competition mode. 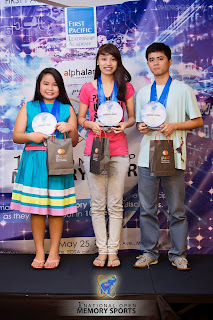 Much like in the Kid's category, the Junior's division was expectedly won by Princess Grace Mendoza, also a veteran of the 2012 Thailand Open and The WMC 2012. But she almost lost the championship to Robert Bryan Yee, one of AB's rookie players from summer, by just a mere four points. Robert Bryan was way ahead from the get go with a 269 point lead as they get into the random words event. But disaster struck for Mr. Yee when he only managed to get a single word correct in his recall for a measly 8 points. This blunder allowed Princess to slash the lead into just 21 points and eventually overtook him 408 point performance at the following event, the spoken numbers. to his random words while Princess is in deep concentration. Being that the scores and results of the events weren't posted at the venue as soon it was available (as I said before, results were only announced during the awarding ceremony, and for the top three competitors only), I wonder how would that have affected the performance of the athletes, knowing that you were behind for such a margin or that coasting through the rest of the events would have clinched the championship? The results could have been very much different but we'll never know. I guess we'll just have to wait and see when they would meet each other again in another memory tournament. 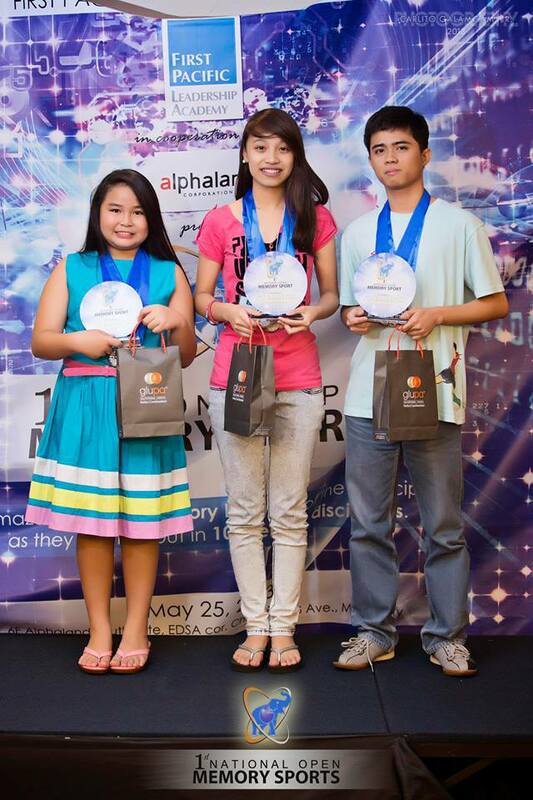 Speaking of which, there'll be another national memory championship (Philippine Memory Championship 2013) to be held at Makati Medical Center this coming July 20-21, 2013. I hope these kids might find it in them to join the said event and I'll have more details about it in my next post, maybe do a liveblog about it too!